With only a few days to go before the first round of voting, a systemic crisis is dominating the campaign in France. It is no longer inconceivable that a Euroskeptic radical leftist or a far-right populist could become the country's next president. This bodes poorly for the French, but also their neighbors in Europe. It sounds like a political parody -- or like a badly overwritten European take on "West Wing." A right-wing populist party has spent months at the top of the polls, neck-and-neck with the former rising star of an entrenched party who decided to bolt and found his own political movement. Right on their heels is the far-left candidate who is experiencing a late surge and outpolling the centrist establishment. Meanwhile, the incumbent, having governed his way to historically low public opinion ratings, has decided not to run for re-election and his party is dead in the water. And the center-right candidate, who looked strong out of the gate, has become embroiled in multiple embarrassing affairs involving greed, his wife and more greed. But he has remained in the race anyway and still has a shot. It is, of course, a completely unrealistic scenario, but it is the thrilling truth in France in April 2017. The main players are Marine Le Pen, Emmanuel Macron, Jean-Luc Mélenchon, François Hollande and François Fillon -- and together, they are illustrating a complete breakdown of established politics in France. Like elsewhere in Europe, France has seen the erosion in stature in recent years of its two main political parties, which once set the course in the country but have diminished considerably compared to the prominence they enjoyed for decades. Populists on the far-right and far-left are gaining in popularity, offering voters the illusion of collective withdrawal: from Europe, from NATO, from globalization, from "the system" and, if they had their way, from the foreigners in our midst. If you add together the poll numbers of the French candidates who are calling for such forms of withdrawal in various combinations and manifestations, you would end up with a majority, sufficient for a coalition government united in its aversion to the status quo. The presidential election in France is becoming yet another end game over Europe's political future. And the poll numbers are currently bouncing back and forth, much as they did in Britain before the Brexit vote and in the United States before Donald Trump's election as president. For weeks, the likely outcome of the first round of voting on April 23 had seemed relatively clear. But now that the election, with 11 candidates in the running, is getting closer, poll numbers are beginning to shift. There is no longer a clear forecast, neither for the first round nor for the second round on May 7, in which the two top candidates from the first round enter a runoff election. According to pollsters, 40 percent of eligible voters are still undecided, meaning that all possible combinations are possible at the moment, and even nightmares cannot be ruled out. Will the runoff be a duel between radical leftist Mélenchon and right-winger Le Pen, two politicians who believe European unification is a plague, who both see Germany as a threat and whose platforms sound like Christmas wish lists? And how is it even possible that such questions are seriously being raised? How did extremists become front-runners? How did outsiders become candidates? Where are the forces of compromise? Where is the political center? Those looking for answers are well advised to step off the dizzying election-campaign carousel. The prevailing feeling in France has long been that of deep-seated crisis. Not just because the threat of terrorism has permeated everyday life in France like a fine mist, more than in most other European countries, and not just because Muslim and right-wing extremist agitators are seeking to divide the country. Not just because necessary reforms in the pension, social and tax system and the pending restructuring of the labor market have largely been neglected for decades, or that the education system is still rooted in the ideals of the 19th century. It isn't just that an elite system is coming to an end, a system that no longer seems suitable for current and future challenges. At times, it has also seemed as if a different, fundamental concern is even more pressing, namely that of whether the French political system is even capable of performing the tasks assigned to it anymore. This is a frightening question, one that, until recently, seldom got raised in highly developed democracies. But today it is a crucial factor in some of the world's largest, oldest democracies: in Britain, in the U.S. and now in France. In newspaper editorials and talk shows, the French are discussing whether their country's institutions have maneuvered themselves into a pre-revolutionary plight as a result of the continued incompetence of public officials. They wonder whether today's state is in fact more similar to the monarchy of old -- to the rotten Ancien Régime shortly before the French Revolution. That may be an overreach, but it is clear that the French electorate no longer has much confidence in its political class, and that the cautious assumption of the competence of political leaders has been replaced by the suspicion of general incompetence. There is also an unsettling, fundamental doubt about the moral integrity of elected officials and government-appointed representatives. At times, it seems as if many French have reached a point beyond political disenchantment, as if they have arrived in a new world of political disgust. A new commitment to not voting and to deliberate abstention has become a daily topic of public discourse. This is all partly the bitter consequence of five years under President François Hollande following five years under his predecessor, Nicolas Sarkozy. Both men took the game of false promises and disappointed hopes too far, and both were guilty of such significant moral failings in their private lives that they shook the French political system to its core. It is no accident that this election includes a number of candidates who are calling for the abolition of the French Republic in its current form and the creation of a new constitution. Such calls were repeated once again on April 4, when all 11 candidates faced questioning one last time in an agonizingly long and disjointed television debate. As always, it was the old Trotskyite Mélenchon who expressed the demand for a new republic most eloquently, saying what he, as a good tribune of the people, always says: That he only wants to become president in order to abolish the office of the president, to abolish the entire French "presidential monarchy." Otherwise, the televised debate was a panoply of crude, esoteric and extreme ideas. The minor candidates with no prospects of winning tried to outdo each other in expressing skepticism about Europe and/or capitalism. The debate was permeated with outrageous claims, exotic theories and false equivalencies. If all of the campaign promises made on that evening became reality, the French would soon no longer be working, but they would still have plenty of vacation, large pensions and substantial government benefits. But the stakes are clear: France is Europe's second-largest economy, a G-7 country, a major world power with a nuclear weapons arsenal and a permanent seat on the United Nations Security Council. If a nation like this is no longer, or only barely, capable of producing a credible candidate for the office of president, there is something rotten in the country. And the consequences could be devastating. If all the polls are correct, it is a certainty that right-wing populist Le Pen will be one of the two candidates to enter the runoff election. If the other candidate is Mélenchon, which has become conceivable in recent days, it would quickly spell the end of the European Union. Le Pen is determined to withdraw from both the EU and the eurozone. Mélenchon wants an entirely new union, and if Brussels and the other EU countries refuse to meet his impossible demands, he too is promising to push ahead with Frexit. With his La France insoumise (Rebellious France) movement, Mélenchon is promoting a debt-financed, 100-billion euro economic stimulus program, the renationalization of airports and highways and other similar measures. He is pledging an absurdly high minimum wage, incredibly high pensions and exorbitant taxes or, to be more precise, expropriations. If Mélenchon were to have his way, all income above 400,000 euros ($425,000) would be taxed at 90 percent. Mélenchon is a far-left populist, a loudmouth with a considerable amount of practice, a man no less dangerous politically than Le Pen. He emulates role models like former Venezuelan revolutionary leader Hugo Chávez and still admires Russia, partly for its Soviet past. He can rudely berate journalists and deeply insult political rivals, but he owes his current success to the fact that he has been biting his tongue for some time in an effort to hide his aggressivity. He would be dismissible if it weren't for the fact that France has a large group of voters, across all social strata, who consistently fall for radical left-wing rhetoric and communist folklore. Mélenchon has "momentum," and his sudden surge in the polls is reminiscent of Donald Trump's late comeback before Election Day in the United States. The radical leftist now stands at 18 to 19 percent in polls, putting him ahead of conservative candidate Fillon, and it seems as if more and more voters now believe in the possibility of a Mélenchon victory and have decided to throw their support behind him. The surprising strength of someone like Mélenchon feeds on the pathetic weakness of the old, mainstream parties in France, which have become disconnected from the people and society, and have lost their desire to shape policy. This is and has been the situation for some time. There is no lack of events that could be used to mark the beginning of the decline. A compendium of political decadence in France would have to include François Mitterrand, who used his abundant presidential powers to hide an entire second family from the world, as well as Valéry Giscard d'Estaing, who had an exclusive sleeping cabin installed in Air France aircraft for himself and his large family. The anecdotes about such courtly and imperious behavior are abundant and by no means confined to history. The current uproar over Fillon's lifestyle, which, of course, includes the fact that top politicians like him accept gifts of tailored suits and Swiss watches worth tens of thousands of euros, ultimately comes from the same roots as the misconduct of the politicians who preceded him. It has only been in the last few years that France has demanded rigorous ethics from its political class -- in contrast to Germany, where this has long been the norm. The idea that German Chancellor Angela Merkel could employ her husband in a fictitious role as her parliamentary assistant, only to pocket the compensation earmarked for the position, seems completely absurd, and yet this is precisely the accusation that has been leveled against former Prime Minister Fillon. In a recent interview, René Dosière, a longtime lawmaker who acquired a squeaky-clean reputation for leading the fight against corruption in French parliament, spoke about his arrival in the National Assembly in 1988. According to Dosière, everything related to party and campaign financing was completely unregulated at the time. It was a common practice for lawmakers to line their pockets by employing people in fictitious positions, said Dosière. He described secret ministry slush funds that were used to pay for whatever popped into the minister's head, and said that the entire budget at the Élysée Palace was "nothing but a black hole" in the days of former President Jacques Chirac. But this is no longer the case, Dosière added. Politics in France is now subject to rigid controls, and no one has the right anymore to describe the political world as a swamp. But this change has not fully registered with voters yet. Whenever a new scandal breaks in France today -- and there are always new affairs -- popular outrage is still directed against the entire political system, not individual cases, and populists of every stripe can easily exploit the scandal for their purposes. You don't have to be a populist to be outraged by the behavior of the conservative candidate, who apparently has no sense whatsoever for today's social sensitivities. When a radio interviewer asked Fillon about the suits he had received as gifts, he responded with an arrogant question: "So what?" Every child in France is now familiar with the silhouette of his private fairytale manor on the Sarthe River. It is outrageous that he is seeking to portray himself as a victim of government persecution and is now trying to drag the country's institutions, including the judiciary, through the mud. The fact that the polls still give Fillon a certain prospect as an outsider has to do with a political pedigree that he alone possesses among the candidates. Conservative, Catholic, middle-class voter groups, which are still larger in France than one would suspect, essentially have no good alternative to Fillon. The Republican Party candidate, an avowed Christian, may be malicious and sanctimonious, but his core statements and his rigid, neoliberal economic platform appeal to many voters. His promises to cut hundreds of thousands of jobs in the public sector, "liberate" the economy, focus on security and trim the social welfare system: All of this is likewise attractive to people in a country that is coming apart at the political seams. When Fillon and Mélenchon talk about France, they don't seem to be talking about the same country. And those aren't the only narratives being peddled. Marine Le Pen has one of her own. She wants to become France's first female president, and she truly has come very close to that goal. It has been a long journey. Her own father, Jean-Marie Le Pen, had to step aside politically because he got in the way of his daughter's own ambitions for power -- and because he underestimated her. But unlike the elder Le Pen, who, in his proto-fascist niche, never truly believed he could ascend to power, Marine Le Pen has long been working to reshape Front National into a major political force, consistent with the outline she presented in her 2006 autobiography. Le Pen is an impressive success story. She transformed her father's rancid club of fascists into a modern political party. And she managed to do what no one had achieved before her, including the many centrists: Le Pen has cracked open France's rigid two-party system and essentially transformed it into a three-party one, with the Front National as the strongest and most stable political force. Le Pen is both the driver and the biggest beneficiary of the systemic crisis in French politics, and she has undoubtedly profited the most from the chronic failings of the established parties. She has also discovered the appropriately catchy, populist formulas to suit her purposes. Years ago, she combined the acronyms of the two established parties into a single string of letters, to make a point: No matter which of the two you vote for, the same system will remain in charge. Sarkozy's conservative Union for a Popular Movement (UMP) and Hollande's leftist Socialist Party (PS) became the "UMPS," and the device still works today, perhaps even more effectively. Now that the conservatives are calling themselves Les Républicains (LR), Le Pen uses the made-up acronym LRPS to ridicule the two major parties -- and it isn't just in French that the letters end up sounding like "herpes." Front National's membership has quadrupled under Le Pen. Today, the party has mayors in 11 cities and has held seats in the European Parliament since 2014, and it is possible that Front National will land more seats in French parliament during this election than the Socialists. A key factor in her success is that Front National has literally abandoned its identity as a party and shifted its focus almost entirely toward Le Pen as its leadership figure. On closer examination, Front National feels more like an organizational structure today, one that is largely invisible. The current campaign is all about Le Pen, and Front National campaign posters don't even include the party logo. Le Pen is portraying the election as a fateful day for the nation, warning of decline and chaos if she doesn't win. "France's existence is at stake," she shouts from podiums across the country. Or, as she did once in February, she stands in the sun at iconic Mont Saint-Michel and invokes French "civilization," France's intangible legacy, and its "exception culturelle." Now, in the final phase of the campaign, she is increasingly resorting to Front National's old tools again. In recent days, she revived the toxic debate over whether France was involved in the deportation and murder of Jews under German occupation, a fact that has long since been validated by historians and accepted by the French government. Like her father did in the past, she is playing up people's fears, apocalyptic visions and fantasies of foreign infiltration. Otherwise, Le Pen has outlined a cornucopia of policies that remind some of her detractors of communist flyers from the 1980s, expanded to include xenophobic frippery like the imposition of a surtax on employers who hire foreigners. She wants to limit immigration to 10,000 people a year, make it more difficult for immigrants to bring their families to France, tighten the borders and so on. Above all, though, she has it in for Europe. "France's independence" is still the first and most prominent of the 144 campaign promises in her platform. She wants to leave the European Union. Yet it is precisely these commitments, including her proposal to reinstate the French franc, that have become the greatest obstacles on Le Pen's path to a possible victory. Hostility toward Europe in France has given way to joyless but stable approval of the country's EU membership. A clear majority is in favor of the country remaining in the European Union, and according to a survey conducted by the Elabe polling organization in March, 72 percent of the French are likewise opposed to withdrawing from the eurozone. Le Pen was asked in a recent TV campaign special what she would do if the French voted to remain in the EU in a referendum she has said she would hold. She normally has an answer ready for whatever question might be asked, but this time she said nothing for a long moment, before responding: "I would resign." When the moderators then asked what the point of a referendum is if she wanted to determine the outcome beforehand, she became angry and quickly switched to her favorite topic: the media's vicious attacks on Le Pen and her party. But the role of the victim doesn't suit her. On the contrary, Le Pen has energetically stirred up French politics and is in no position to complain about antagonism. To win the election, though, including a possible runoff, she'll need a Brexit or Trump effect, a major last-minute surprise. And because even that no longer seems impossible in French politics these days, Le Pen's election prospects have truly become the subject of great concern. Moderate French voters who value compromise and reason are betting on Emmanuel Macron, the 39-year-old shooting star, whose talent is undisputed but who has not yet proven his abilities beyond all doubts. The initials EM stand for "En-Marche!" Macron's movement, which translates as "Forward!" or "Let's Go!" or, literally, "In Movement!" New supporters are flocking to Macron in droves, from both the right and the left, and they include cabinet ministers and fellow politicians who previously couldn't stand him because he was too ambitious for their taste. Macron became economic adviser to President Hollande at 34 and economics minister at 36. He left the government at 38 to prepare his own presidential candidacy, and now, at 39, he is in an in extremely strong position on the eve of elections. It has been a remarkable career. If Macron and Le Pen both emerge from the first round of voting, a scenario pollsters had considered to be the most likely until recently, it will amount to a battle between two worlds. Both politicians believe there is a systemic crisis in France, but they have completely different definitions of what that means. Be it Le Pen, Macron or Mélenchon, all are beneficiaries of the decline of established politics. Macron is a product of the allegedly outdated system. He completed the classic path to success in France, attending the best schools. The son of a doctor from Amiens in northern France, he was all but destined to become an Énarque, the term used to describe graduates of the elite École nationale d'administration (ENA) in Strasbourg. Before Hollande brought him into the Élysée Palace as an adviser, he worked as a banker at Rothschild. On the campaign trail, he has repeatedly pointed out that it was at Rothschild that he "learned a profession" he is proud of. When his opponents attack him by bringing up his past, especially his time as an adviser to Hollande, Macron rejects their accusations. Referring to his stint as a cabinet minister, he says: "I saw the emptiness of the political business," which, he adds, is precisely why he is qualified to explain how to fill that emptiness. Macron often sounds like a man of the Third Way once pursued by former British Prime Minister Tony Blair and, in his own way, by former German Chancellor Gerhard Schröder. His movement, launched only a year ago in his hometown of Amiens, now has a quarter million followers. For months, the old political class derided the initiative as a sort of popular movement for the overly motivated and naïve. Going door-to-door with questionnaires and then using the responses to assemble his political platforms, as Macron did, was inconsistent with the self-image of the ruling political class. But the establishment is no longer smiling today. Macron holds his campaign rallies in the country's largest arenas. If he wins, he will be the youngest president in French history, and the first without a major party affiliation. He is the only candidate whose platforms could be called pragmatic. He strives for realism and evolution, not revolution. Macron is one of the few candidates in favor of the EU, and he promotes the dream of a "New Deal for Europe." He defended Angela Merkel's refugee policy against public opinion in France, saying that the German chancellor had rescued the dignity of Europeans. As president, Macron says he would tackle all the major issues, bring an end to France's reform gridlock, modernize the social systems and the labor market and cut spending to a moderate degree. When he is accused of not reaching far enough, his response is that there have been too many empty promises in the last few decades. Is he the savior he portrays himself to be? Or just a clever protégé of failed President Hollande? His bid for France's highest office is clearly passing through a precarious phase at the moment. Although new, prominent supporters are backing his candidacy, his poll numbers are stuck at about 25 percent or are even declining. He lacks a single, catchy slogan. And perhaps, to a certain extent, he also lacks substance. The Socialists meanwhile would be pleased to have such minor concerns. The party is a sinking tanker piloted by its top candidate, Benoît Hamon, who promises many good, leftist policies but has had trouble attracting attention. He is not entirely to blame, however. His weakness ultimately reflects the state of the Socialist Party, which is incapable of producing clear political positions and is especially afflicted by the general systemic crisis, one that has gripped the two major political families and is a result of both parties' weak track records in governing. Jacques Chirac's second term, which began with an overwhelming victory against Jean-Marie Le Pen in the second round of elections in 2002, has become the epitome of a politically stagnant era. After that, beginning in 2007, came the no less empty hyperactivity of President Nicolas Sarkozy who, together with Fillon, not only failed to reform the country but also poisoned the tone of political debate in France. He was finally replaced by the "normal president," Hollande, who also lacked the stature to structure the office of president for the country's benefit, or even to fill the office on a human level. He also happened to ruin the Socialist Party. No French politician has encountered the kind of maliciousness in recent years that Hollande did, though he also did his own part to further his demise. He agreed to embarrassing documentary films and allowed cartoonists to spend a year accompanying him at work. He talked to journalists constantly, writing them emails and text messages -- and he always came across as tired, as the wrong man for the job. The French president has remarkable powers to shape policy, but Hollande took little to no advantage of them. At the beginning of his presidency, he declared the fight against unemployment as his most important task, but it remains as high as it was at the time of his inauguration. His reform policies generated significant ire, and then didn't produce the desired results. The economy, which Hollande planned to jump-start with a "toolbox" of measures, remains stagnant, and if it does flourish here and there, it is despite, and not because of, Hollande's policies. On social issues, he has unwittingly awoken a conservative Catholic movement and has likely done more harm than good for the cause of gay and lesbian couples. His worst mistake, which severely damaged the Socialists' credibility, was the robust demand that convicted terrorists be stripped of their citizenship, a measure that may suit dictatorships well, but is hardly appropriate for a country that is seen as the birthplace of human rights. Hollande did a decent job when it came to lamenting the victims of terrorism. But that did nothing to save him from record-low popularity -- approval ratings so abysmal that he didn't even bother running for a second term. And as determined as Hollande has been on foreign policy -- with military missions worldwide, including airstrikes in Syria -- it was not enough to rescue him from the depths of his disrepute. During the campaign prior to his own election, he promised: "Moi, president, I as president will ensure that my behavior is always exemplary." It was an important message, after the tenure of his predecessor and rival, Sarkozy, which had its share of affairs and love dramas. Most of all, though, it sounded credible, coming as it did from this wallflower from Tulle in the French provinces. But then photos were released that have been burned into the French consciousness: Snapshots of the motorcycle-helmeted president on amorous nightly excursions to his secret lover. The photos did a great deal of damage: They made him look like a political clown. Hollande, who had vowed "to unite and pacify" as president, stirred up the rage and divisiveness in the country more than any of his predecessors aside from Sarkozy. He exacerbated an already rampant frustration with politics in the country, he discarded his relationships with police officers, teachers, the Socialist' voting base, and he incurred the wrath of doctors, farmers and Catholics. And where Sarkozy frayed nerves with his impulsiveness, Hollande incensed voters with his passivity and indecisiveness, which he then sought to peddle as prudence. Most of the candidates who have felt the need to run for president this year aren't even qualified to lead a country, let alone a nuclear power or Europe's second-largest economy. If it is true that a nation only gets the political leaders it deserves, then things are not well in France. There are real causes for concern -- not just for the French, but also for their neighbors. IT USED to be much easier to spot the difference between the presidents of America and China. One would argue for free markets and economic liberalism, the other for centralised control. One would endorse democracy and the rule of law, the other freedom from outside interference. As Donald Trump geared up to meet Xi Jinping for the first time this week, in a summit in Florida that was due to start after The Economist went to press, those differences have narrowed (and in some areas, such as climate change, the positions have flipped). This is partly a matter of style. Both Mr Trump and Mr Xi adhere to a personalised, “strongman” view of leadership. The American president is literally a brand; the Chinese are being encouraged to pledge personal fealty to Mr Xi. But it is also a question of substance. Both men claim to be supporters of free trade but subscribe to a doctrine of economic nationalism. Chinese regulators use tariffs, antitrust laws and state media to target foreign firms; officials shovel subsidies at national champions; uncompetitive state-owned enterprises refuse to die. For his part, Mr Trump vows to get tough on Chinese imports and threatens blanket tariffs. He sees the world as a series of zero-sum games, in which countries with trade deficits lose and those with surpluses win. Both leaders are suspicious of openness. Under Mr Xi, China is one of the most closed big societies on Earth. The Great Firewall censors the internet. Capital controls are designed to stop money flowing out. Investment restrictions impede the path of money coming in. America is built on different precepts entirely. But Mr Trump has isolationist instincts. He wants jobs, supply chains and technologies to be located within America. He sees migration as a threat to be managed, not an opportunity to be encouraged—this week he began to tighten up the processes for work visas. He, too, likes walls. Such attitudes serve neither country well. For evidence of the merits of openness, both leaders need only look to the most dynamic parts of their economies. Silicon Valley is envied around the world for its agglomeration of talent, capital and ideas. It is also a hymn to cosmopolitanism. According to a study in 2016, immigrants founded or co-founded more than half of America’s unicorns—privately owned startups valued at more than $1bn. More than a third of the valley’s population is foreign-born, compared with a national average of 13%. But inside China, too, the case for openness has powerful backing. Exhibit A is the Pearl river delta (PRD), a megalopolis in southern China that comprises nine cities in Guangdong, as well as Hong Kong and Macau. As this week’s special report lays out, the PRD has been the beating heart of the China miracle. Thanks to the liberal economic reforms introduced into the PRD by Deng Xiaoping from 1980 onwards, a sliver of land with less than 1% of the mainland’s territory and 5% of its population produces 10% of its GDP. The PRD owes much of its success to the fact that it is overwhelmingly private: of more than 100 centrally controlled SOEs in China, only four are in this region. But its transformation also owes much to an embrace of foreign ideas and investment. The sleepy town of Shenzhen was designated a special economic zone in 1980; foreigners were actively encouraged to put money in. Shenzhen is now the Silicon Valley of global hardware startups, attracting investment from around the world; the delta accounts for a fifth of China’s foreign direct investment. There is little corruption or red tape involved in exporting goods or importing components; local officials toast foreign businessmen rather than try to shake them down. Hong Kong’s democracy is being stifled by the mainland government, but its economy is a conduit for global expertise and capital: mainland companies make up around half of the market capitalisation of the Hong Kong stock exchange. There is no equivalence between the American and Chinese economies. Capital, people and ideas still flow freely into and out of America; China’s relationships with the outside world are semi-permeable at best. But where once it was obvious that the leaders of America and China would embody these differences, now neither truly believes in openness. Mar-a-Lago may be where Mr Xi and Mr Trump meet, but they should not forget the lessons of the valley and the delta. Is the number one commodity in today’s world. Unless you can get it, you cannot proceed. 1. You don’t get multiple bites at the Apple. Since attention is scarce and stretched, if someone checks you or your product out and is not closed, chances are they will never check it out again. Which is why you should not launch before you are ready and when it comes to a product many companies release first iterations as betas, signaling the customer should expect rough edges. If the concept is good, if the utility is reasonable, people will put up with bugs in betas. 2. You can’t spread the word, your users must. Advertising is crippled. As is press. They can cause a limited amount of awareness but people today are turned off to ads, never mind DVR’ing TV shows and watching HBO and Netflix, they employ ad-blockers on their web browsers and if you’re paying for advertising you’d better have a monster launch with a ton invested otherwise it’s a no-go, and it still may be a no-go if you spam everybody. Because you can’t reach everybody and people are wary of advertising, they don’t believe it, they need to hear it from their friends. We all need to hear it from our friends. Who we might know in person or might just know online. It’s about trusted filters. And those filters guard their credibility wisely. Credibility is everything in the attention economy. If you can’t be trusted, then you’re probably going to be ignored. You’re building your reputation every day online, and all the bread crumbs are there for everybody to see. We don’t take a look until our friends/trusted filters tell us to. And oftentimes, we have to hear from multiple friends/trusted filters that something is worth checking out. 3. Overnight success is history. MTV blasted acts to the moon and they fell to Earth just about as fast. If you can gain major attention in today’s world right away chances are you’re going to immediately fail thereafter. Because few things live up to the hype and the hype causes backlash and in today’s world it’s not about stagnation but evolution, what does version 2.0 look like, how good is the follow-up song. When the bar is set so high to begin with chances are you cannot jump over it the second time around and people will stop paying attention. 4. That which is big may not be anointed as so. Forget the awards shows. Hell, look at the Oscars, those pictures they were honoring all had mediocre grosses at best. And the media is a tool of the companies purveying. Other than politics and wars, where newspapers have full time reporters, the rest of what comes over the transom as news is really glorified press releases. So you read about something and then it has no traction thereafter. Because it’s not that good and there is no base to sustain it and the press is not that powerful. No one has come up with a metric to detail what gets attention in today’s economy. We’ve got grosses in film. Ratings in television, but the best shows aren’t rated. And we’ve got streams in music. All these quantifications are relevant (and ignore the weekly “Billboard” chart, it’s out of touch!) But how to quantify the success of “Hamilton,” which for over a year played in only one theatre and has had no Top Forty success, but is referenced by Seth Rogen at the Oscars, sung along to by Melinda Gates... “Hamilton” has yet to peak and unlike so much other art it crosses ethnic and political boundaries, it’s one of the few things that appeals to all. But there’s no chart, just a lot of press which doesn’t resonate. But when someone tells you about their favorite “Hamilton” song... Then you feel the bond and know how big it is. We all have our own internal chart now. We determine whether something is big or small. And we do this by gut feeling. Hell, the media missed the Trump phenomenon completely. But based on the blowback I was getting online I knew something was up. Don’t follow leaders, watch the parking meters. If you don’t think something is that big, despite the press hosannas, it’s probably not. 5. Don’t hammer the audience. If you spam us every day looking for attention we ignore you. Launch and then follow up. New songs/more product is much more important that more publicity. Satiate the core, which wants more. It’s the core who will spread the word. But if you drop an album and promote it for two years you’re missing the point. You’re going after the looky-loos, the least committed people, your core is burned out on your new work and abandons you. You need to keep the attention of the core. And the more you say “Look at me!” the more you are ignored, or made fun of. Sure, there’s train-wreck attention, where someone blows themselves up and we all know about it, but it lasts for about a day. The most successful people in today’s economy are accessible. Look at Mark Cuban, responding to the hoi polloi’s tweets. He could run for President and win, he’s more credible than Trump and on TV every week too. So come down off your throne and get in the pit and mix it up a bit. People want to be able to touch you, even if it’s only online. You’ve got no time and they don’t either. Even babies are scheduled, we’re all overwhelmed. It’s a privilege to get someone’s attention, you’re not entitled to it. Ask for it nicely and thank people for giving it and don’t ask for too much. Ask people to listen to one song, not an album, if they like the one they’ll ask for more. If you send ten, they probably won’t listen at all. You don’t want to overload people. You cannot push, that’s positively last century. Sure, you can grease the skids, pour some oil to get something started, but it’s only working if people are demanding more. And if they are not, you don’t have a marketing problem, you have a product problem. Marketing has never meant less. It’s seen as phony and manipulative. You lead with your product. And it’s either growing or failing. Either every day more and more people are watching your YouTube video or you need to make another one, that’s different. 9. You rarely feel like you’re winning. With everybody clamoring for attention and traditional news outlets challenged you oftentimes don’t know whether you’re winning or losing. Which is why today it’s about stamina and follow-through. When someone hypes you on the work of a twelve year old, laugh and ignore it. The “artist” doesn’t have enough experience to understand the game, they just want fame. And those seeking fame first and foremost are losing out in the attention economy, because it’s not about the one time buy, but a continued relationship. And when there’s no there there, people move on. So you’ve got to polish your product and create new ones and stay in the game, constantly tweaking what you’ve got and trying new things, and if you’re getting more attention you know you’re on the right track, if not, back to the drawing board. This is where we are today. Tomorrow will be different. Virality is a thing of the past. As in faking it to get everybody to pay attention, it rarely works anymore, we’ve seen the trick and if you’re trying to goose the process for instant success you’re on the wrong track. Today it’s about an overwhelming number of messages, tomorrow it’s about the winnowing down of those messages. What will this look like? Will there be new gatekeepers? Will so many outlets fail that the ones remaining have more power? If you’re not reevaluating and pivoting on a regular basis you’re being left behind. Now, more than ever, what worked yesterday won’t work tomorrow. So you have to keep experimenting. But success remains tied to attention. Your goal is to get people interested, dedicating their time, giving you their money. And the more sunlight there is online, the less fakery there is too. So, instead of promoting, you should be practicing. The truth is we’re all looking for great stuff 24/7 and if we find it we tell everybody we know. Let it be you we are telling everybody about. SINGAPORE – In ancient times, Chinese emperors never traveled to another country to meet its new ruler. Rather, that ruler, or his envoy, would visit China’s imperial capital to request investiture from the Son of Heaven. 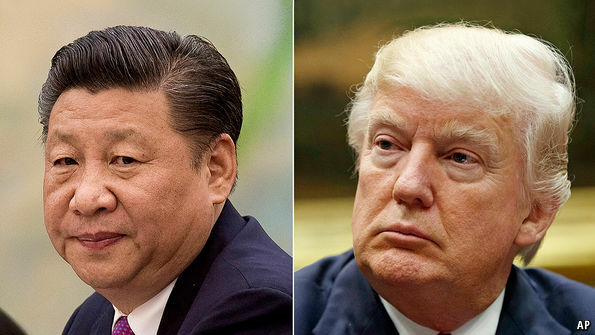 The fact that Chinese President Xi Jinping has traveled thousands of miles to meet US President Donald Trump at Mar-a-Lago, rather than receiving Trump in the Forbidden City, suggests that China recognizes its own status as a lesser power vis-à-vis the United States. But that does not mean that Xi considers this status to be permanent. On the contrary, he might be anticipating that the two countries’ strategic standing will change very quickly if the US does not do more to preserve its global primacy. Discussions about China’s rise and America’s relative decline have been ongoing for almost a decade. But the notion that China would replace the US as the dominant global power was not considered plausible – by either the Chinese or observers around the world – until Trump’s presidency. This new perception could be further reinforced at Mar-a-Lago. Although the event has been presented as an occasion for the two leaders to become personally acquainted, Trump reportedly intends to raise at least three major issues with Xi: America’s massive trade deficit with China, North Korea’s nuclear program, and the territorial disputes between China and US allies in the South China Sea. Each leader undoubtedly wants the other to make concessions on these issues, so that he can emerge “victorious” from the summit. Trump needs a favorable outcome to compensate for a series of domestic political failures that have severely eroded his political capital and sent his approval ratings to record lows. And Xi wants a diplomatic victory to bolster his political standing ahead of the Communist Party of China’s National Congress in November. On trade, Trump wants to curtail Chinese exports to the US, presumably by imposing higher tariffs on Chinese goods and pressuring US and international manufacturers to move their production facilities to America. But Trump is unlikely to get his way on this issue. Unilaterally imposing tariffs on Chinese imports would likely trigger trade disputes, invite Chinese retaliation, and hurt US businesses that create wealth – and deliver affordable products to American consumers – by basing their production facilities in China. A better alternative for Trump would be to persuade China to import more from the US. But making that change would take time for China. And, on the US side of the equation, Trump cannot simply dictate quotas for companies, which must base their decisions on market conditions. Meanwhile, Trump has implied that he might somehow soften his stance on the trade issue if Xi offers to help rein in the North Korean regime’s nuclear ambitions. But Xi, knowing that he has the upper hand on the trade issue, will not be easily swayed. Instead, he will probably offer China’s cooperation in exchange for the US halting its deployment of a Terminal High Altitude Area Defense (THAAD) anti-missile system in South Korea. Trump would most likely reject this proposal. And yet he may be overestimating China’s influence over North Korea. The North conducted its recent nuclear and missile tests despite Chinese sanctions, which have halted coal imports from North Korea – the regime’s main revenue source. If China has less control over North Korea than many assume, Xi may be unlikely to offer any strategic concessions to Trump to address the nuclear threat. The same can be said for the South China Sea issue. China has defined its territorial claims as a “core interest,” which implies that it will use force to defend its position there. Some observers have criticized former US President Barack Obama for being too soft on the issue, because he allowed China to assert its claims unchecked over the past eight years. Yet it is unlikely that Obama could have done anything to stop China without risking a major great-power conflict. Trump also wants to stop China’s strategic encroachments in the South China Sea; but, as his meeting with Xi will prove, his options are as limited as Obama’s were. Given these constraints, Trump will almost certainly fail to secure a political victory at the summit. Xi, meanwhile, can return home triumphant by simply standing his ground. This likely outcome will further strengthen the view that the US is losing global influence to China, especially among observers in the Asia Pacific region who have watched Trump scrap the Trans-Pacific Partnership and cease Obama’s strategic “pivot” to the region. Owing to the deep divisions within American society, Trump’s isolationist, anti-liberal administration may already lack the political capital and determination to delay, let alone reverse, the momentous shift in global power toward China. That shift will only accelerate further during and after Trump’s presidency, unless major changes are made to retain America’s costly, hard-earned global preeminence. US growth, such as it is, has lately been driven by a handful of hot sectors. Car sales have set records, high-end real estate is generally way up, and federal spending – based on last year’s jump in the national debt – is booming. (Wall Street Journal) – The annual pace of light-vehicle sales fell to a seasonally adjusted 17.2 million in the first quarter from 18 million. That the decline has come despite generous incentives from car companies and still-low gasoline prices suggests that sales are past their peak. The upshot is that the deferred purchases that helped bolster business coming out of the recession have been made, and it will be up to replacement demand and a slowly growing population of registered drivers to fuel auto sales. If car makers are lucky, sales might stay on their recent level. If they aren’t—and the recent drop in used-car prices raises that prospect—the trend could be lower. In either case, autos might count as a negative for consumer spending and the industry, a big driver of economic growth, could be an outright drag on the economy for the first time since 2009. (Bloomberg) – General Motors Co. said a glut of used cars will return to market after their leases expire and drag on its finance unit this year, following similar warnings by peer Ford Motor Co. and lenders such as Ally Financial Inc. The prices of used cars in GM Financial’s leasing portfolio will decline about 7 percent this year, GM Chief Financial Officer Chuck Stevens said on a conference call with analysts Thursday. The value of used GM vehicles have depreciated faster than expected in the first quarter, particularly with crossovers, and prices will fall as much as 3 percent next year. Ford touched off concerns about declining used car prices late last year, when the automaker cut its lending unit’s profit forecast by $300 million. The National Automobile Dealers Association’s used vehicle price index plunged in February by the most since November 2008, spurring concerns about the fallout for automakers, lenders including Ally Financial and car-rental companies such as Hertz Global Holdings Inc.
Housing may be about to go the same way. Mortgage rates are rising, which means the real cost of owning a home — already up dramatically in the past few years — is about to jump again. (Wolf Street) – Condo sales in Miami-Dade County have plunged. Condos on the market have surged. Supply has hit 14 months. Developers are sitting on completed units they can’t sell, and months’ supply in their projects has reached several years. A fresh round of distress signals sounded in the retail industry this week, as another big-name chain announced hundreds of new store closings and still others moved aggressively to recalibrate their businesses for the online shopping stampede. Payless ShoeSource filed for Chapter 11 bankruptcy and outlined plans to immediately close nearly 400 of its 4,400 stores globally. Ralph Lauren is shuttering its flagship Polo store, a foot-traffic magnet on tony Fifth Avenue in Manhattan, the latest step in a massive cost-cutting effort. Big-box office supplies stalwart Staples is reportedly considering putting itself up for sale. The shakeout among retailers has been building for years and is now arriving in full forcé. Many have begun cutting back, sending ripples through the economy. The wave of store closures by Macy’s and Sears alone will empty 28 million square feet of retail real estate, according to an analysis by research firm CoStar. Often those vacancies are slow to fill, leaving shopping centers less hospitable to the chains that remain, feeding even more departures and job losses. These are some serious headwinds, and it’s not clear what offsets them. Could be that the only source of future growth is the government, which means the Fed will soon have to reverse course, cutting interest rates and buying up even more of what used to be known as the free market.